Have You Thought About Painting Your Lawn? Do you ever feel like you’ve tried everything and still you can’t keep your grass green? Or you live in a drought or frost-stricken area where nature doesn’t ever seem to get a chance to work its magic on your lawn? Well, great news! There is an alternative. It’s called lawn painting – which we discovered today by accident when a friend shared a lawn painting video on Facebook. Joanne, is lawn painting new in Australia? As far as I know, this is a brand new product (called ColourGuard) that has just been introduced into Australia by Lawn Solutions Australia which oversees the nation’s best and most experienced turf growers. We are very excited for our customers. This idea of having a “green” lawn during the winter period gives you the best of both worlds – a drought tolerant grass that is green during the colder months. Why do people get their lawn painted? If for example you wish to sell your property during winter, this is a fantastic option as you have the option of a lush green lawn for your advertising pictures to entice those potential buyers. Also, some people just prefer a green looking lawn all year ‘round. Are there particular lawn types that might most benefit from lawn painting? Yes. The drought-tolerant turfs such as Sir Walter Buffalo, Nullarbor Couch and Eureka Kikuyu all lose colour when they go dormant during the colder winter months, so these grass types would be perfect for lawn painting. just want a green lawn all year around (with the option of a drought tolerant turf). Can you tell us how the product works? How long after application is it until the kids can play on the lawn again? It takes approximately 2 hours in full sun to dry completely. After this, it is fine to walk on your newly “green” turf. Won’t it wash away when the rain comes? No it is a “tint”. It won’t wash off, run or stain. It is also completely safe for the environment and most importantly, painting your lawn is safe for your precious children and pets. Joanne, where can people find you in Melbourne and what else does The Green Centre offer? We are a family run business that has been supplying residential and commercial customers with quality organic garden supplies, instant turf products and redgum firewood across Melbourne for over 20 years. Established in 1993, we were one of Melbourne’s first green waste recycling depots, expanding quickly into soil recycling. The Green Centre has always maintained our “green” values and ensure our practices are in line with what’s best for the environment. 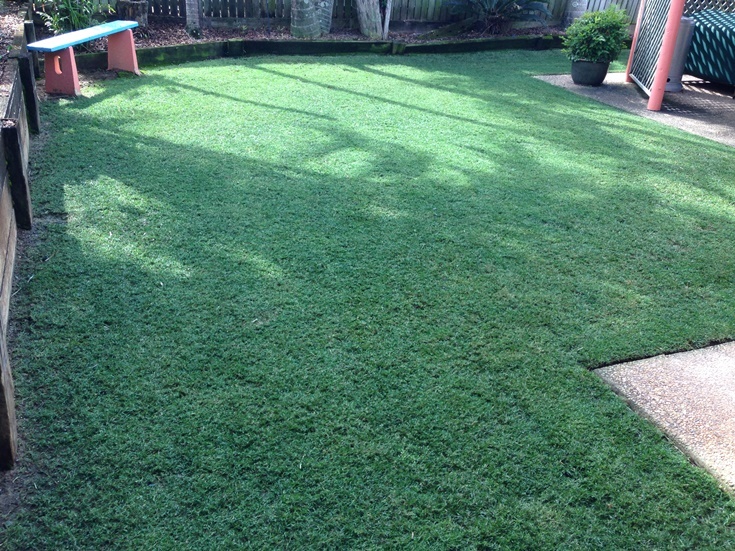 We are also a certified “Lawn Solutions” supplier of instant turf selling a wide variety of quality grasses including Sir Walter Buffalo, Australia’s number one lawn. Big shout of thanks to Joanne for answering all of our questions so quickly (phenomenal customer service!). If you’re interesting in painting your lawn, or you’re in the market for garden or lawn supplies, check out The Green Centre in Keilor Park, Melbourne (great people there!) or visit their website shop online. Lets bring this action to Queensland! Give us a call if you are interested in placing an order on 93315300. Do you apply it yourself and how much is it? I am interested to see the reviews for this product. I am currently living in Townsville, where the dam is at 15% and we are on level 3 water restrictions. When you currently look around Townsville there is nothing but yellow/brown turf/grass everywhere. I inquired about this product at Bunnings and they knew nothing about it. Has anyone used this product in far north queensland? Hi my name is Tony and I have a Jims mowing franchise in Townsville North Queensland. I have heard about similar product over the last few days and would like to try your product out up here. Could you please send me a price list for the Grass paint shipping details, MSDS and any other info I could need. I would like to try it out on my own lawn then try to market it to my customer’s here and then expand from there. Thanks for your comment, sounds like a great idea. We have had a really great response to the launch of this new product in Australia, and I expect the more people that here about it, the more it will sell, and of course it is very affordable. Where else can you get a drought tolerant grass that is green all year? Please call (03) 93315300 or send and an email to info@thegreencentre.com.au for further information and to discuss shipping fees (these will depend on quantities ordered). We would love to chat with you further regarding supply of this product. I would like to try this product but I am concerned that it might be a ‘fake’ looking green. Is it possible to post me a bit of card or something that has had this product sprayed onto it so that I can see exactly what colour green it is? Hi Dianne, We’re not selling lawn paint ourselves at this stage. Try contacting The Green Centre in Victoria? We operate a business in WA performing this service in WA. Look us up if you are interested, or fire me any questions you may have. Well it is getting to The stage around here where grass paint is no longer just a crazy gimmic seen in The States but a thing that actually makes sence around here. I would love to test it but wonder what happens if it gets on your concrete paths and garden edges. Does it come off or how do you avoid Staining other garden features? ? I’ve used this product before and it’s great! We did manage to get a bit around the edges on things like the concrete curb and retaining wall. It will stain them if not removed quickly. My partner used a scrub brush to get it off the driveway. Next time we will probably lay some newspaper around the edges. It’s definitely worth it, though. We had the best looking lawn on the street! Hope this helps. I have used this product, and my partner and I were extremely happy with the results! It didn’t last 3 months, but I’m sure there are many factors that contributed to that. We had the best looking lawn on the street for weeks! In terms of fertilising, we didn’t notice too much of a difference, but we were still happy with the product. We are getting ready to host an engagement party in our backyard, and will definitely be applying ColourGuard prior! The solution does “stain” things like curbs, gutters, and retaining walls. My partner was able to scrub most of it off before it really dried, but I think next time we may cover those things with newspaper or something. I would definitely recommend this product! Not a bad price, either. Reborn Lawns was the first company in Australia to provide turf painting services with an environmentally friendly product imported from the USA. Check out their website: http://www.rebornlawns.com.au You will find all the information you are seeking there.